It's hard to target the right customers with the right offers while staying within budget and channel capacities -- and without cannibalizing future sales or saturating customers with too many messages. Optimization can help you resolve these complex issues by balancing your organizational constraints with the need to improve results. 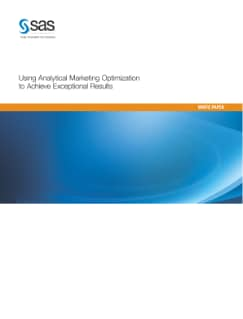 This paper explains how marketing optimization can help you improve campaign revenues by up to 25 percent, and describes how the technology can be implemented successfully with SAS' powerful, easy-to-use approach to marketing optimization.